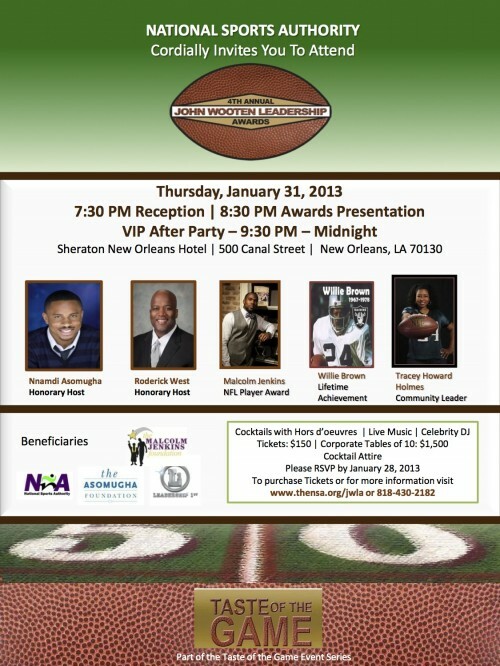 The 4th Annual John Wooten Leadership (JWL) Awards will be presented at the awards ceremony on Thursday, January 31, 2013 at the Sheraton New Orleans located in downtown New Orleans. The nominating committee for the John Wooten Leadership Awards recently announced the recipients of the 4th Annual John Wooten Leadership Awards. Malcolm Jenkins of the New Orleans Saints is the winner of the Pro Award, recognizing a lifetime commitment to service and unparalleled leadership on and off the field www.malcolmjenkinsfoundation.org. The Community Leader Award will be presented to Tracey Howard Holmes in recognition of her leadership in advancing United Way’s work in education and health through its longtime partnership with the National Football League. The Lifetime Achievement Award will be presented to Oakland Raiders’ Hall of Fame cornerback Willie Brown in recognition of his commitment to excellence and service on and off the field. All-Pro cornerback Nnamdi Asomugha of the Philadelphia Eagles and Roderick West, Executive Vice President & Chief Administrative Officer, Entergy will service as this year’s honorary hosts. 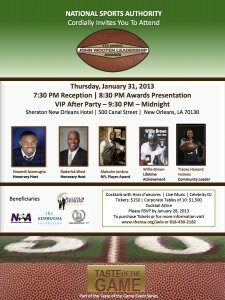 “We are honored to have Nnamdi Asomugha and Roderick West join us as we spotlight these outstanding individuals who are making a difference throughout the communities we live in.” saysEverett Glenn, President of the National Sports Authority.. The John Wooten Leadership Awards are presented annually to the college and professional football players whose play, community and extracurricular activities best exemplify the leadership and vision of John Wooten, whose NFL career has spanned over 50 years as a player and front office executive. Affectionately known as the “Godfather”, Wooten’s level of influence knows no bounds and his blessings and endorsement can build a career. Commissioners, general managers and head coaches seek his advice and to gain his counsel is the key to gaining knowledge and insight that is virtually unparalleled in the NFL. As Chairman of the Fritz Pollard Alliance, John has been a major instrument behind the successful movement for diversity in the NFL. The Alliance was established in honor of Fritz Pollard, the first African American to play in a Rose Bowl Game, the first to quarterback an NFL championship team, and the first to coach in the NFL.